As you enter our sanctuary, you will see the Congregation Emeth Memorial Boards, located on the wall of the sanctuary. When attending a service or ceremony in our sanctuary, or anytime you might choose to enter the sanctuary, the presence of the Memorial Boards offers a way to reflect upon loved ones who no longer are with us. Entered on the Boards are Yahrzeit Plaques. Each Plaque commemorates the life of a person who is special to those who have made a donation for its purchase. Yahrzeit Plaques can be added to a Memorial Board by any Congregation Emeth member at any time. The name of a loved one, family member or friend, will be engraved on the Yahrzeit Plaque and added to the Memorial Board when you choose to make a request and donation for its purchase. Each year, for the entire Hebrew month of the person’s yahrzeit, the light by the plaque will be lit in remembrance. The donation for a plaque is $360.. Donations are deposited in Congregation Emeth’s general fund. As always, Congregation Emeth is extremely grateful for your donations. 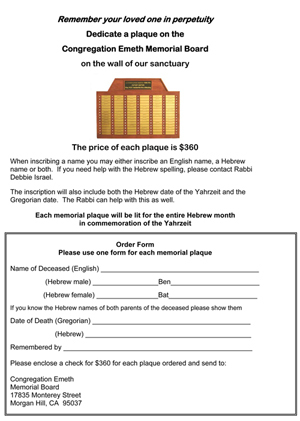 What better way to both commemorate a loved one and support our congregation than to purchase a Yahrzeit Plaque for our Memorial Board? To request a plaque, please complete and mail us the order form with your payment.